I used Nubar Reclaim as a base, with Nubar Forest applied with Konad Plate m64 for the design! Topped off with 2 coats of Seche Vite top coat. Love them! Since I've found your blog, I've started painting my nails almost everyday- nothing half as cool as yours. I think the wildest I've been was a French manicure. Ha! jealous. 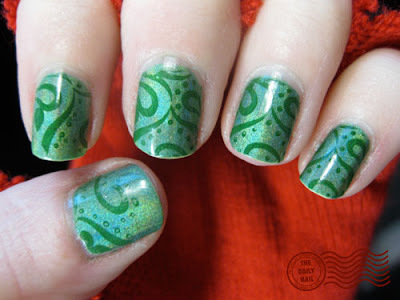 since i discovered this blog, i've been getting yens to pay attention to my nails again. but alas i have no talent for it. Also, I was wondering if there were any looks you were going to repeat once you'd made your goal of 365 designs. Basically, which ones are your favs that you'll return to again and again in the coming years? I think you should definitely do this one again (and it would look great in purple or red). Green is my favorite color and these are amazing! The History Enthusiast- there are a few that I DEFINITELY want to do again after my 365 days.... I loved the Simpsons ones, The Fail Whale, Pollock, and of course, the one that got such a huge response, the BACON! :-P There were others I'll definitely do again, but I think those were my favs. I did really like the Holla!-graphic ones, too! That is a super cute design! Sooooo cooool. I think I'll make that my first Konad plate. I can see this design in orange with maroon, too- giving it an Indian/ Moroccan vibe. Haha, I DO love Reclaim, and I've bought a few more of the China Glaze OMG line. China Glaze commented on twitter on the Holla!-graphic post, and I told them I looooved them, but they need to make a dark green and a dark grey holo, like we commented on, and they said that it was a good idea. lol *crosses fingers* here's hoping! I love the glitter/shine in the background! These nails are ADORABLE. Do you do this for a living? these are SO cute! i wish i had the time to do this everyday, such a conversation starter! Oh, I forgot to say above, I think I've got a new one for you- it's not exactly a dark grey holo, but it's what I've been making do with- it's Color Club's Revvvolution (head2toebeauty has it), and it's pretty great.